Walter Richard Rudolf Hess (Heß in German) (26 April 1894 – 17 August 1987) was a high ranking Nazi leader, and one of Adolf Hitler's closest men. He was the third man after Hermann Göring in the Third Reich from 1933 to 1941. 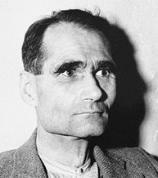 Rudolf Hess was born in Alexandria, Egypt, but moved back to Germany in 1908. He joined the army in World War I and was trained as a pilot. In 1920 he joined the Nazi Party and in 1922 he also became a member of the SA. He flew to Scotland during World War II and was arrested. After the war he was tried at the Nuremberg Trials, and sentenced to life imprisonment. He died in the Allied Military Prison, Spandau, Berlin in 1987. Rudolf Hess Facts for Kids. Kiddle Encyclopedia.